As starts go it wasn’t the most propitious. 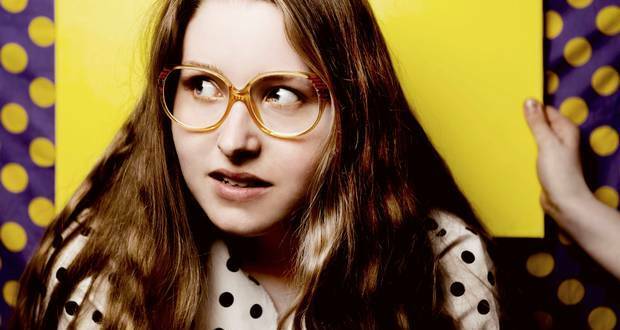 Jessie Cave announced that Emer Kenny hadn’t made it to the Fringe and her own solo show was a work-in-progress. Having made the announcement from behind a crudely drawn cardboard cut out of a face, Jessie kept it there for another 10 seconds to mask her disappointment if anyone left. The twenty-somethings in the full-house audience stayed put. They’d likely come to see Jessie anyway, given her Harry Potter fame as Lavender Brown. Jessie’s on stage persona is a nerdy, needy young woman with pigtails, oversized specs and multiple obsessions. She reveals her back story through interactions with her mother, father and friend/boyfriend – cardboard cut outs all. Child-like drawings on the wall and homemade props complete the low tech feel. It’s not just character comedy. It’s character comedy of the highest order. Jessie’s set was beautifully observed, superbly nuanced and brilliantly performed. Helped, it has to be said, by one skilfully written scene after another, each bearing a high quota of laughs. Only a couple of times late in the show was it evident it was a work-in-progress. Jessie performed the set up before disarmingly breaking character saying “I’ll need to put a funny bit in there”. By that time, the audience knew she has all the tools to do just that. Forget Grawlix, the show that never was. Jessie and her complex, flawed character will live long in the memory. For someone of her limited comedy experience, she displayed an astonishingly assured hand both in its performance and writing. As starts go, Jessie Cave’s comedy career is looking most propitious. It won’t be long before you’ll be hearing and seeing more of her.